Description: BNSF Northbound Coal Train E- PAMNAM at Jasper, Al. Description: A SB BNSF SD70MAC leads a sister and 118 cars south thru Larkspur Co. Description: #884 rolling along the Mississippi River at Donehower. Description: #884 snakes its way into Dakota MN. Description: Empty coal train rolls down Crawford Hill. Description: Coal train rolls through Provo South Dakota. 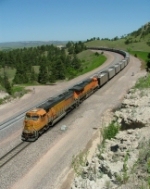 Description: Loaded coal train rolls through Ardmore South Dakota. Description: Dang! I forgot there was a plow there. Description: This is the one that wouldnt start. Description: Headed north into Old Monroe. Title: BNSF 8826 Leads a Mac Attack On a empty coal train. Description: pretty nice to see as these mac's day's are numbered. Description: Empty BNSF Dynegy Midwest Power (Peoria, IL) to Black Thunder Mine, WY (Diverted to North Antelope Mine) train E-PHPBTM0-31 rolls through Haymarket in the Lincoln Terminal. Construction of the new Husker Basketball Arena can be seen. BNSF SD70MAC 8826, BNSF ES44AC 6145, 133 empties, 0 loads, 3312 tons, 7060 feet, rear DPU BNSF ES44AC 5771.